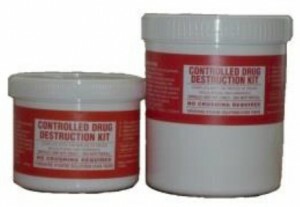 Controlled Drug de-naturing kits are available in 500ml and 1000ml capacity. All CDs must be de-natured before collection. Instructions for use are included on the label. When the drugs have been rendered irretrievable the containers should be placed in waste medicine containers. CD kits must NOT be placed in bags of any denomination or in external wheeled storage units.